Individual coins come in protective plastic. Orders in multiples of 25 will come in mint tubes. 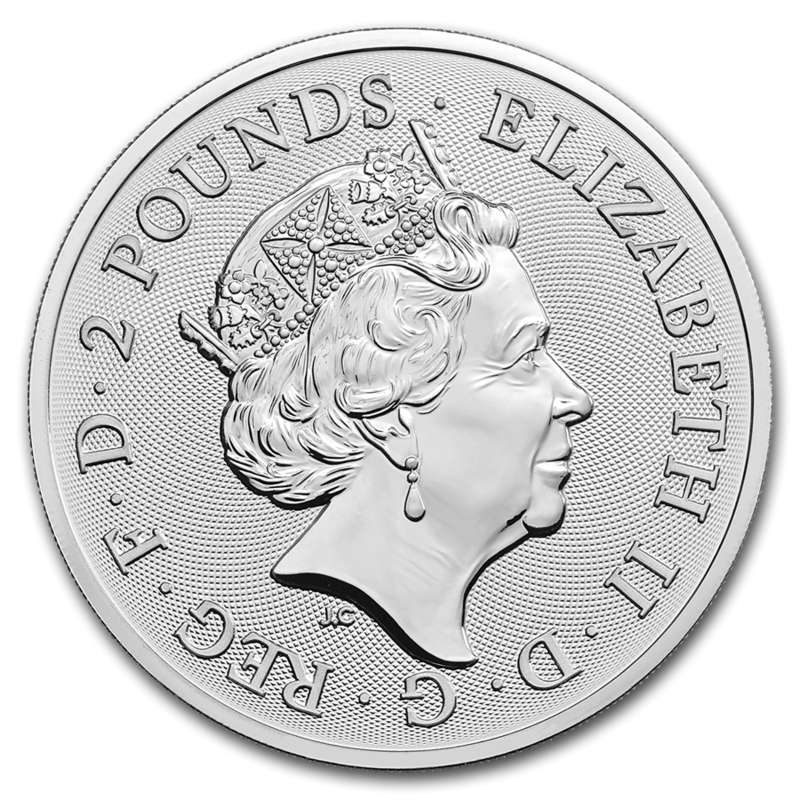 Obverse: Displays the effigy of Her Majesty Queen Elizabeth II, along with the face value of 100 pounds on a guilloche design. Reverse: Features the current variation of the Royal Arms, with a quartered shield, each representing nations under the United Kingdom. The coin features a radial background, exemplifying the design. This Silver bullion coin from The Royal Mint features the Royal Arms, a symbol of strength and majesty. 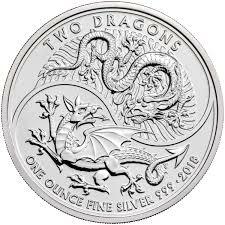 The awe-inspiring design is depicted on 1 ounce of .999 fine Silver, and is the newest addition to The Royal Mint Silver bullion range. 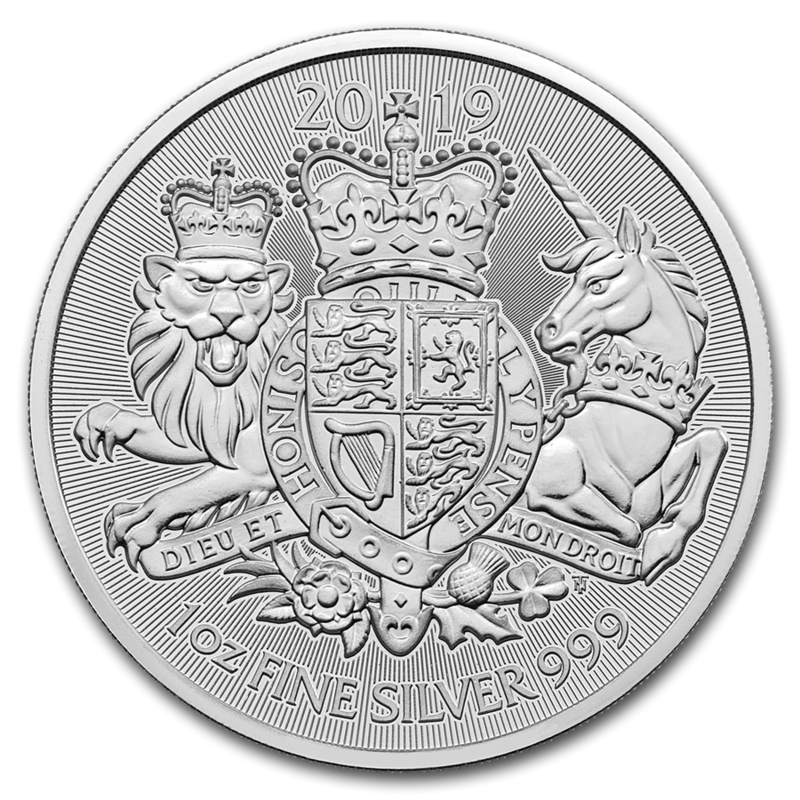 This 2019 Silver Royal Coat of Arms coin would be a great addition to any bullion collection. Add this 2019 1 oz Silver Royal Arms coin your cart today! The iconic Royal Arms design by Eric Sewell has been reinterpreted on this 2019 bullion coin by coin designer Timothy Noad. The Royal Arms quartered shield depicts three passant guardant lions of England featured in the first and fourth quadrants, and in the second, the rampant lion and double treasure flory-counterflory represents Scotland. The third features a harp for Ireland. The shield is supported on one side by the crowned English lion and the other by the Scottish unicorn, and has a Garter circlet surrounding it, inscribed with “HONI SOIT QUI MAL Y PENSE” (shame on he who thinks evil on it). Also featured is the leek of Wales. The Royal Arms has been a mainstay of British coinage for centuries, and symbolises strength and majesty of the monarchy of the United Kingdom. The Royal Arms is still used today as a symbol of authority and identification, while the Royal Standard, a banner of the Royal Arms, is also flown from the royal palaces when the monarch is at home.